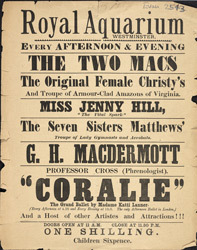 One of the performers featured in this bill for the Royal Aquarium is the famous comedienne Jenny Hill. Known as ‘The Vital Spark’ for her larger than life stage persona, she had started her career appearing in taverns and small halls, singing other people’s songs. She was soon spotted by Maurice de Frece who became her agent, and she worked the music halls for 25 years. Her repertoire mostly consisted of saucy cockney songs, like 'Arry' and 'The Boy In The Gallery', which made her popular with audiences across the country.